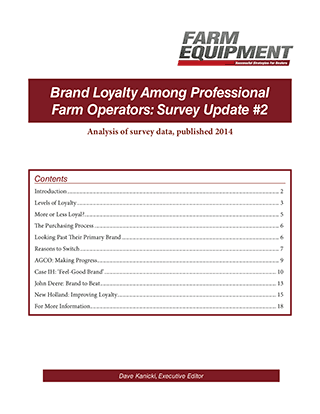 This “Brand Loyalty Among Professional Farm Operators: Survey Update #2” report shares how you can maintain farmers’ brand loyalty, and how to win over prospective customers, and it’s FREE! There are 2 things all of us know about customer loyalty: it takes an ongoing, sustained effort to earn and maintain it, but almost no effort whatsoever to lose it. Customer loyalty isn't forever. Many farm equipment dealers believe that loyalty to specific equipment brands of ag machinery has diminished over the years, and has been replaced by demanding, price-shopping farm operators. Yet when farmers are surveyed about their allegiance to “their” equipment brand, the data tells a different story and two-thirds still look to buy from their primary supplier. Brand loyalty is alive and well and every bit as solid as the last Farm Equipment brand loyalty survey of high-acreage farmers 3 years earlier. But equipment purchases are no longer about the nearest dealership or what “Dad and Granddad did.” The relationship must be worked at to protect the loyalty inherent to your brand. Conversely, opportunity exists to change customer’s preference if your competitors are on cruise control. To help make you aware of the opportunities, we’ve compiled the results of this farm survey on brand loyalty into a special E-book download — and we’ve made it absolutely FREE to get it into the hands of as many marketers as possible in a time when every potential sale counts. Download Brand Loyalty Among Professional Farm Operators: Survey Update #2 now, and start the ball rolling on more equipment sales today. This Special Report includes the survey results of all aspects of brand loyalty in the farm equipment industry, all in one reader-friendly report. It shows farmers’ current pattern of decision-making and compare it to 3 years prior to see how it’s changed. It’s the kind of report you and your team will turn to again and again as you review customers vulnerable to competing brands, and strategies for those “color conquest” sales. Keep it handy as a primer prior to those important sales calls! Discover the paths to winning, and keeping, customers who’ll think YOUR brand first. Understand how “brand-loyal” farmers really are toward the “major” brands (AGCO, Case IH, John Deere and New Holland) already on their farm, and how that loyalty has changed over the years. Discover the 6 types of farm equipment outside of their primary brand that they are most willing to explore. Learn the top 12 reasons that drive farmers to consider a choice outside their primary brand. Gain confidence in the “conquest sale” by knowing each brand’s competitive vulnerability, and where the window of opportunity exists for your team. Unlike prior generations, the consolidating farm market won’t produce enough “new customers” for your equipment business to grow accidentally. Dealers and manufacturers must 1) protect their own, and 2) work to convert the others. Both dealers and manufacturers come armed with pre-conceived notions on brand loyalty that are often different from what farmers say. Farm Equipment commissioned both of these farmer studies to remove the mystery of brand loyalty and to bring expectations in line with reality. We know time is money. But if you did nothing more than scan the 20 color-coded chart and tables in this FREE report, you’d be significantly ahead. Would you be surprised to know that price is not among the top 5 reasons farmers switch from their primary brand? Three of the top 5 revolve around the dealer’s ability to provide parts, service and product specialists. To understand these trends and how to leverage it for your business, Read our FREE Special Report, Brand Loyalty Among Professional Farm Operators: Survey Update #2. This special report includes survey data — and its expert analysis — of professional farmers of 1,000 acres or more in 10 states throughout the Corn Belt and Lake states agricultural regions. The analysis also compares data to the inaugural study conducted 3 years prior to measure how attitudes toward brands are changing in the U.S. Keep it handy for your strategy discussions. Discover the traits of the brands that are most farmer-loyal. YES. I want this FREE Special Report! That’s the kind of actionable information you get throughout this FREE report – all of the data presented in clear, straightforward language, and with easy to follow charts and tables. For every question you and your team consider, you’ll find a way to exponentially increase your effectiveness, while better assisting your customer make sound decisions in the process. Read this free report right now to learn how to make this important topic a #1 directive for your team this year. Survey data affirms that parts availability and dealer service are imperative to customer loyalty. “Color conversions” are difficult but not possible. Over half of the farmers cited 4 “very important” reasons why they would switch brands, 3 of which directly surround the dealer. Price is seldom a factor in farmers switching brands, no higher than #6 on the list of reasons that farmers change brands. These are just some of the takeaways you’ll find by downloading this free report and reviewing it with your cup of morning coffee. 69% of farmers identify themselves as brand loyal, up from the previous survey. Case IH and John Deere have the most brand-loyal customers. Want to convert a John Deere customer? Dealer service repair is number 1, significantly more important than 3 years ago. The equipment farmers will most often buy “outside” of their primary brand is spraying equipment (#1) and tillage equipment (#2). Want to convert a buyer who first looks to Case IH? Parts availability is the hot button. And that’s just the tip of the iceberg. Put some of the findings in this survey through the lens of your company and situation and you’ll break from your meeting energized by the possibilities. Discover the traits of the most effective loyalty-builders. By now I’m sure you see the value of this carefully-prepared Special Report and what turning in to this knowledge can do for your business. No one who wants to their company to be a leader should overlook it! And because you’ve taken the time to read this, you’re clearly a person who values how to protect, and grow, the stake you’ve already claimed in the farm equipment business. That means you’re exactly the kind of person we hope to reach with Brand Loyalty Among Professional Farm Operators: Survey Update #2. The kind of “in-the-know” person your team expects out of a leader. If you’re a manager today, you know how valuable reports like this are to calibrate and validate current thinking. If you’re still developing as an equipment marketer, you’re eager for the foundation and new ideas to increase your success. Either way, what better way to move forward than with this comprehensive, authoritative – FREE – report? Do you want to be one step ahead of brand preference trends? Are you prepared with a refined approach to send your sales professionals up the driveway of that farmer using a rival brand? Do you know how to erase your farm customer’s thought of a brand switch, before it ever arises? Then download this free report right now, and get started. The minute you do, you start the momentum toward greater sales. Dave is the Executive Editor of Farm Equipment, and the Editor/Publisher of Ag Equipment Intelligence and related properties. PS: Where do all great sales growth arise in the farm equipment industry? Winning, keeping and re-selling customers. Find out how to do it by downloading Brand Loyalty Among Professional Farm Operators: Survey Update #2 right now. PSS: There are many ways to build your sales. You can start you and your team on the path toward more loyal, sustainable customers by reading this free report now. Discover the keys to loyal farm equipment customers. We understand that your email address is private. We promise to never sell, rent or disclose your email address to any third parties. You can unsubscribe from our mailings at any time.